Oh my! Nothing little about that finish. How clever. They are absolutely gorgeous. Definately crochet queen of 2016 girl! How neatly they sit inside each other - great!! Wonderful, Barb. You are the crochet queen. These are so gorgeous - well done! They look wonderful Barb. 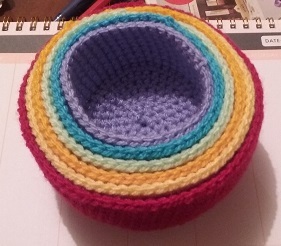 Lots of lovely crocheting at your place at the moment.